Even with the wet weather being absolutely disgusting, we got some great pictures of the lambs. 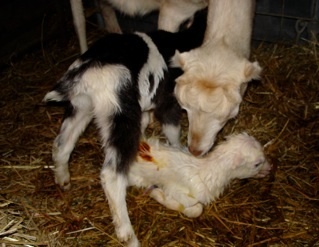 Pippi, one of our yearling LaMancha does, decided it was time to have her baby today. Of all days. Torrential downpours, high winds, and the greenhouse is getting very crowded with mamas and babies. Chloe called me at work to say that it looked like she was having some trouble. She and John decided that we needed to get help more quickly than I could reach home, so we asked Pam of Hatchtown Farm to lend a hand. She did have to help our little guy out; he had achieved elbow-lock behind Pippi’s pelvis and needed a little arm extension. Pippi was tired from all that work, so I am glad they were able to expedite things. Now they are comfortably ensconced in the post-partum greenhouse, and he is hopping around happily. They are very pleased with each other! We had another hopping night early Friday morning. 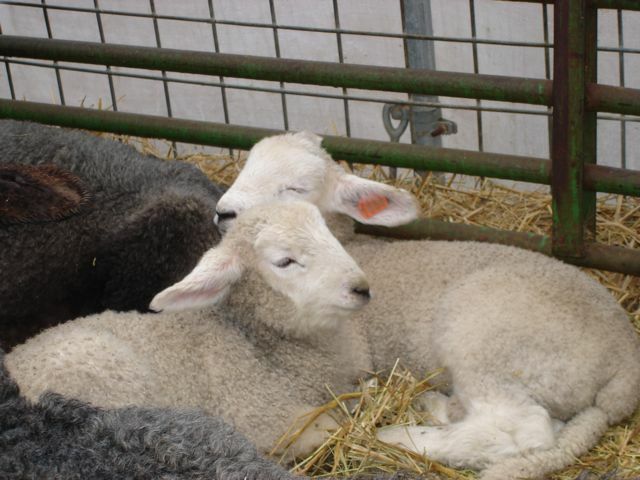 Lupine took her time to deliver two large and beautiful white ewe lambs, floppy ears and all. It was really late by the time we got to bed, but we knew the girls now outnumbered the boys! Very exciting. 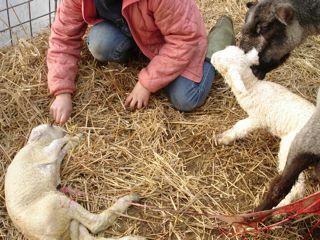 So we had 18 lambs on the ground (with the ewes winning the day) and a buckling and doeling of SnowPea’s. But, Friday really wasn’t our day. 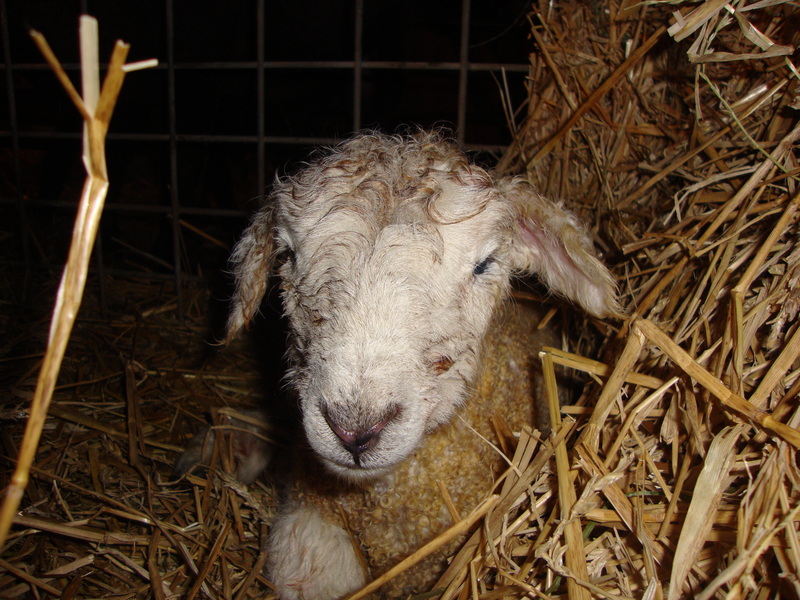 John had to call me at work to tell me that the doeling got caught in a feeder and strangled, and later on, Meadow’s ewe lamb was crushed to death when the ewes got panicked by a dog harassing them. Not a good end to the day yesterday. All I can hope for is that luck doesn’t really run in 3s and this is it for the year. The ewes had the advantage for a brief moment on Friday, but now we are back to neck-in-neck. I don’t really care about the numbers, just hate hate hate losing little ones this way. HoneyBea decided to allow us to get some sleep last night, thank goodness! Went out to do chores at 5 last evening and she was cleaning off a ram lamb, with the hooves of her ewe lamb peeking out at us. 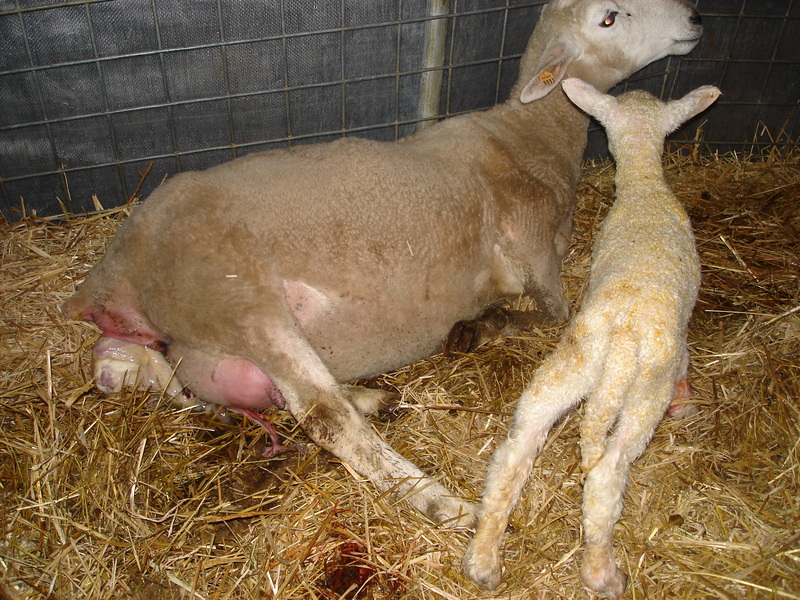 She was determined not to let that second lamb get born until she was finished with #1. Very funny. Great mother! 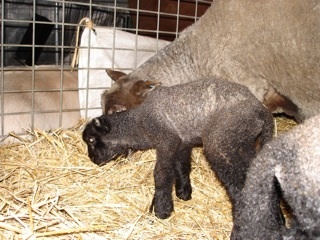 The darker of the two, her ewe lamb isn’t much smaller than the ram and they are both doing beautifully. Because of the torrential rains and the wind we were getting yesterday and last night, we locked all the ewes and lambs into the greenhouse with all the “jugged” mamas and babies. It was definitely a very busy place. If we had had any more lambs last night, there would have been standing room only on that bus! The lambs were hopping around getting in everyone’s way, but after all the hoopla died down, things got quiet, and they all settled in for a dry evening. A little sleep deprived, but all in all, very content this morning. Yesterday afternoon Pam came over to see Meadow’s new lambies, and as it had been raining hard, we didn’t rush right out to the greenhouse. 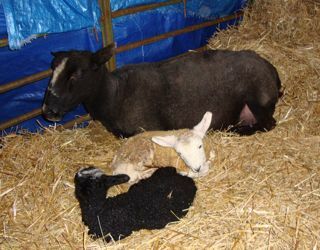 When we did get there, who was inside, but Lucy – a first-timer – and two gorgeous, black ewe lambs! Talk about color genetics! Mr. Big, the AI white Border Leicester ram is the father. 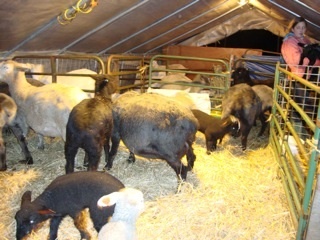 And these aren’t the only black lambs that have come from his crop of babies this year. Apparently, although my understanding of color genetics is sketchy, I would think that Mr. Big must have some recessive black genes in there. I was thinking that we have never had black lambs from him in the past, but I need to look at my records to be sure. It’s been a very interesting lambing! 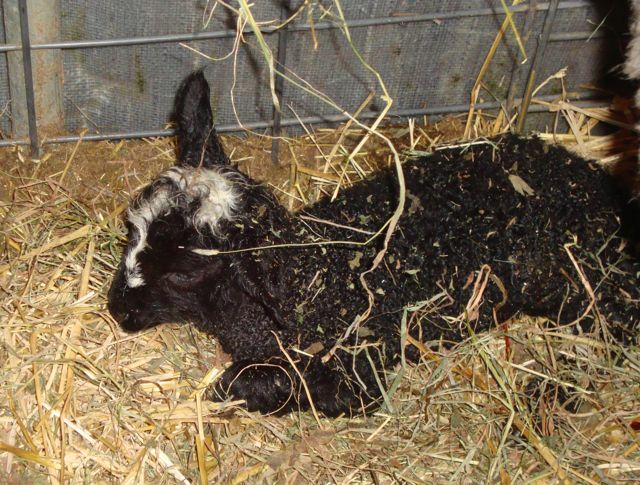 I locked everyone into the greenhouse last night as the weather was getting worse, and again in the wee hours we had another set of twins, this time from Raven, a very dark ewe. 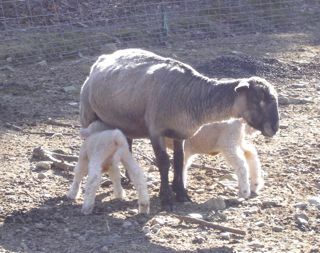 Two white ram lambs from Mr. Big. And they are big boys! 11 and 12 pounders. Very cute, and very quick on the uptake. Full tummies in no time at all. And we still have our 50/50 split of rams and ewes! 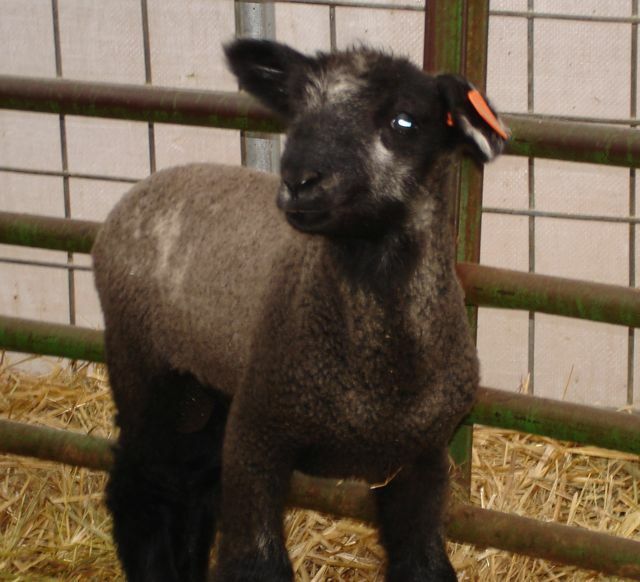 Raven's other lamb has droopy ears! Our first early morning lambing went off without a hitch. Meadow had a beautiful black ewe and black ram a little after 2 a.m. Our son very kindly checks on the ewes and does before he goes to bed (which is way later than we do!) so we have the ability to get a little bit of sleep if there looks like nothing is going on. He knocked early this morning to tell us that Meadow was looking like a possible, having taken up residence in the deserted greenhouse in one of the “favorite” lambing corners. We gave her a little bit of alone time, and when John got out there he called to say that number 2 was being dried off (the picture above) and number 1 was up and about and mostly dry. 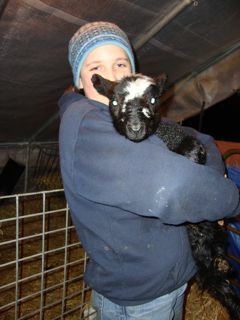 They are the first lambs of the year that were sired by a ram lamb of ours from last year: Hamish the blue Coopworth. 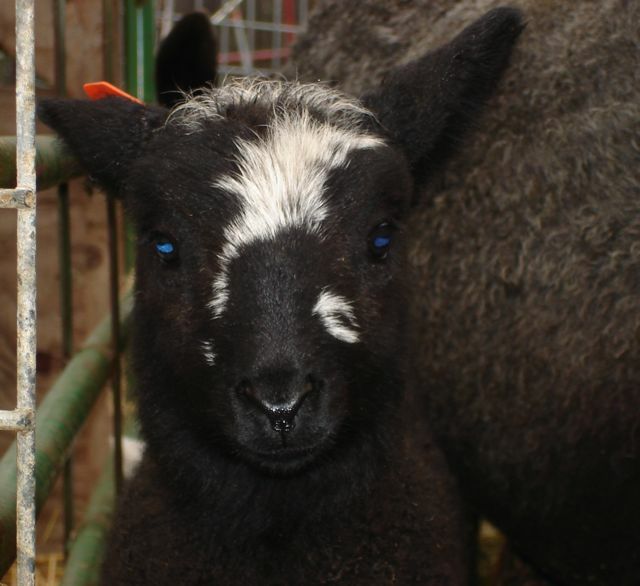 Both the lambs have the beautiful markings on their eartips – lighter around the edges – and the white teardrops that indicate the “blue” gene. And the lighter grey “saddle” around their middles. 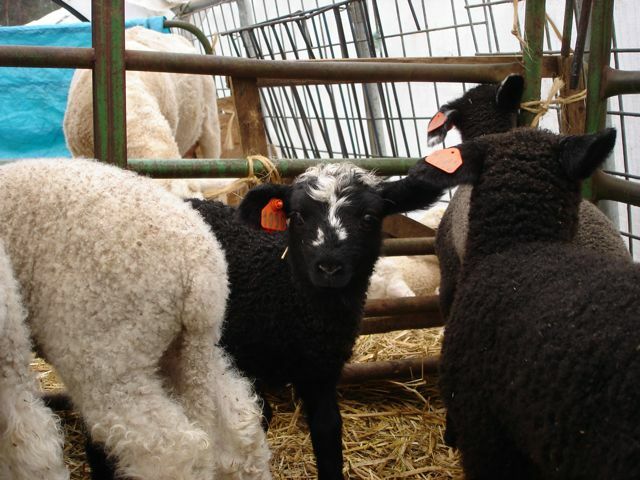 Sheep color genetics are quite the mystery to me, but our friends at Hatchtown Farm have spoken about them in their blog. I really look for the “blue” in our Coopworths as I think the silver-blue-grey that comes out in their fleeces is the best thing ever. And as Pam of Hatchtown points out, dyeing the silver fleece or yarn yields such an amazing color palette. Much more subtlety and depth than on a white fiber. So we have two more lambies in the greenhouse and still have our 50/50 split on the sexes. I have never seen it fall out this way! When I did chores this morning, Meadow’s babies were hopping around the pen while Meadow had a well-deserved rest. 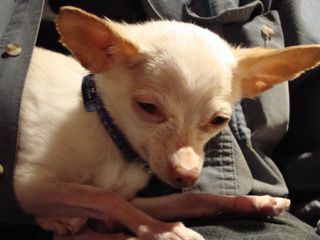 Poor Tesser the Chihuahua! She had to have her teeth worked on this past Wednesday and was in pretty rough shape when we got her home. I have only seen her in this condition once, when she had a really bad reaction to a vaccine, but she’s older now and the poor thing suffered! I don’t think chihuahuas are known for their sterling teeth, and Tesser’s were no exception. She is the sweetest little dog ever, but come at her with a toothbrush or a nail clipper and you are going to lose your hand. So we knew it was time to have her teeth scaled and cleaned professionally, but we didn’t realize how bad her mouth really was. P.S. : We love our vets! 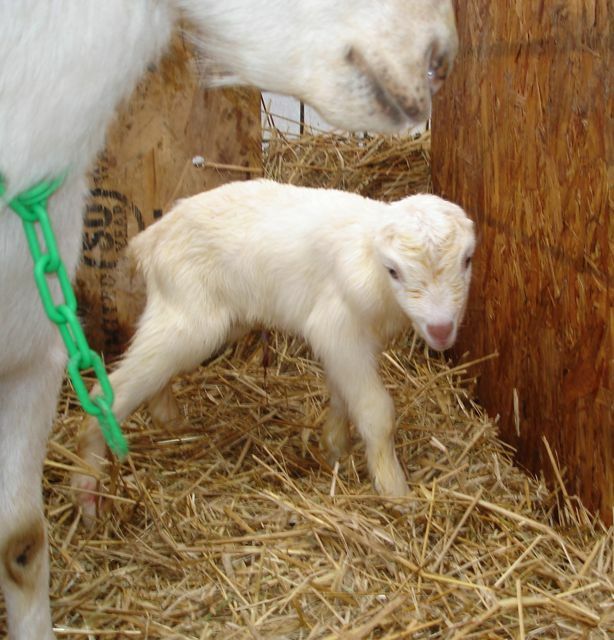 Yes it was Tuesday yesterday, and yes we did have a lovely birth event: SnowPea had a beautiful black and white buckling (9 lbs), as well as a petite, white doeling (6.5 lbs). It was quite the evening! SnowPea walked away from the feeder at 4 o’clock and I took one look at her sunken sides and decided to pen her in the greenhouse. Suffice it to say, she was very grumpy with me. Chloe, Kali, John and I ended up checking on her periodically until a little after 6 when she got down to business. 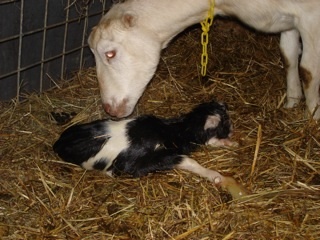 I don’t remember how big her buckling was last year (a single), but this boy had quite a time making his entrance into the world. I thought I was going to have to help him, but all the correct parts were peeking out at us – two hooves lined up properly, and a pink nose on top of them – but it took over an hour for SnowPea to get him on the ground. 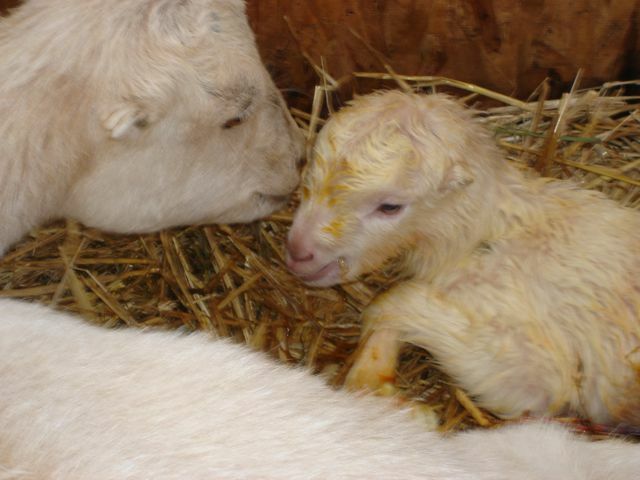 She was immediately smitten, and spent the next hour getting him cleaned up before she had her little doeling, who just shot out into the world and was up and ready to go within minutes. Her brother was dopey and wobbly for over 1/2 an hour, but I would think that that may have been due to his protracted birthing. And then the ultimate humiliation, SnowPea stepped on him, not once, but twice! Anyhow, the three were happily ensconced this morning in their jug. By the time we went to bed last night, they were nestled in the straw with mama goat and had full bellies then, as well as when I was out there at 6. And last night’s 3 hours in the greenhouse was really beginning to get cold, so John came to the rescue with a portable heater for the humans and saved the night. Even though the temps are over 50 during the day, it’s been getting down into the mid 20s after nightfall and our tootsies and hands sure appreciated it! Oreo the goat may be next on the hit parade. And we still have a 50/50 split between the males and the females. That’s pretty extraordinary. But it definitely makes me happy! 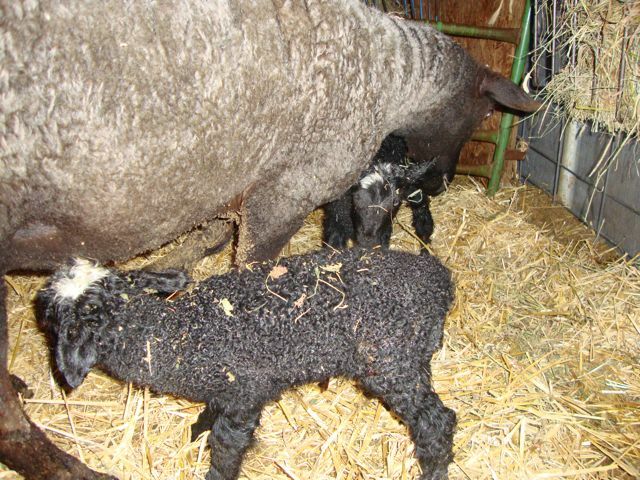 Last night our lovely ewe Mae had enormous lambs: white ram, 15 lbs, black ewe, 13 lbs. 10 oz. Holy cow! 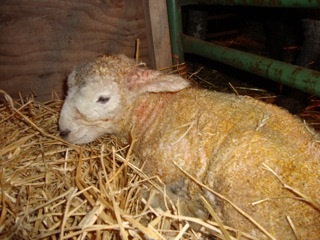 We had been checking on her around the clock because she was due Sunday and she usually lambs a little ahead of time. She’s older, and I was a little worried about her. I shouldn’t be, I guess! We checked on her around dinner time and she showed absolutely no signs of labor, and when I went out at 9:15, there were two babies, up, cleaned off, and fed. They were very nonchalant about it and came willingly into a jug where we did all the usual things and got them bedded down for the night. Not bad, although by the time I got to bed it was 11:30, which is way past my usual bedtime. But I slept well after all that excitement! 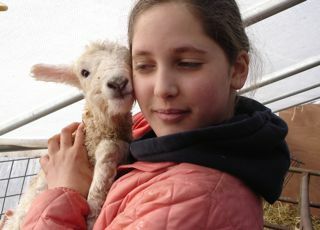 Chloe with Mae's enormo ewe lamb! Stopping for a nosh, enjoying the sun! Kate and 11.5 lb. ewe number 1! 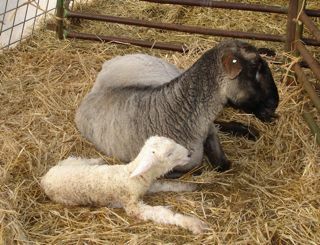 Kate, one of our Coopworth ewes, had her lambs on her due date this morning. We bred her to our Border Leicester ram, Mr. Big, and I knew I needed to keep an eye on her. Border Leicesters generally have much longer legs than Coopworths, so when we crossbreed them I am always watching for problems. Kate went into labor this morning and nothing was happening; I penned her in the greenhouse and she was hysterical for breakfast, but that wasn’t going to happen. She really needed to get down to business, and when I realized that nothing was happening, I knew that I needed to help her. So I got my lambing kit and checked her out: #1 ewe lamb had a really big head, and her elbows were caught behind her mom’s pelvis, so I had to help her out. Once she made her appearance, Kate went to work and got her cleaned up and ready for breakfast. 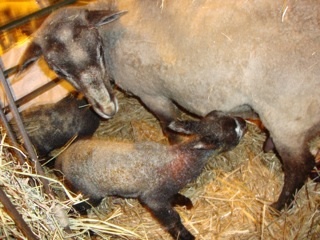 She is a fantastic mama ewe, and she was excited about her girl. I think Kate has only ever had rams before! So this was a new experience for all of us. Once she had this big girl, we thought that she was done. 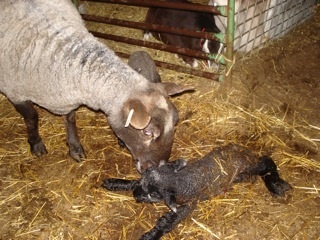 But while she was cleaning ewe #1 off, she lay down and ewe #2 just popped out, like a diver jumping off the high dive! 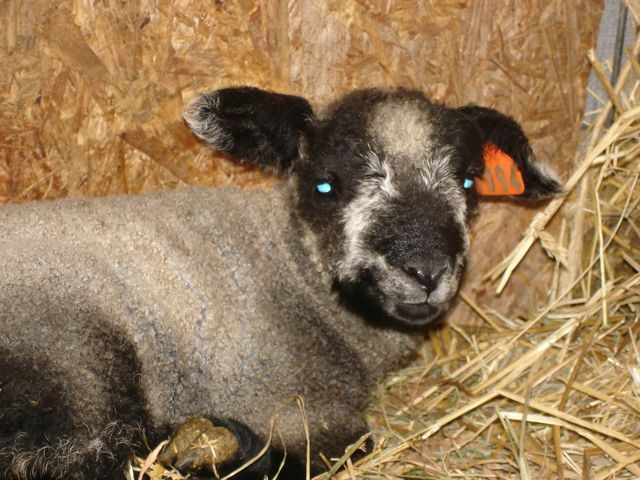 Both ewes are 11+ lbs and gorgeous! Both ewe lambs are doing well, except that I needed to clip both of their lower lids. Entropion has reared its ugly head. We have been using electrical alligator clips that hold out the lid until it stays where it is supposed to be. Chloe was a big help today and we got a lovely picture of her with one of the ewes after we weighed, clipped and dipped the umbilical, and gave her the BoSe shot to prevent White Muscle Disease. Great and beautiful day to be born!